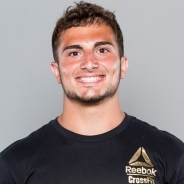 In 2015, just one year after starting CrossFit, Nicholas Paladino became the first champion of the Teenage Boys 16-17 Division at the CrossFit Games. In 2016, he became the division’s first repeat champion, defending his title with three event wins and no finish outside of the top three. In his second season, he won the worldwide Open in his division and was also chosen to compete in the live announcement of Open Workout 16.3 against then two-time Masters Men 40-44 champion, Shawn Ramirez. Known for his strength, Paladino won his division of the CrossFit Liftoff weightlifting competition in 2015 and took second in 2016. A former football player, Paladino trains at CrossFit Steam in East Rutherford, New Jersey.